When using the previous Affinity Beta and now the new Beta 243, I find that problems have been inherited by the 243 build. Up to last week 11/02, I could use the programme without serious problems. Then week beginning 11/02, when I tried to load a tiff file that had been processed from the raw file, by the beta programme, I started to receive a message reading that a non beta file could be damaged by loading it into the beta programme. The file had already been processed into a tiff by the beta, so it appears to be a false negative. Then after downloading the new beta 243, I am receiving the same message, for any file that has beem processed in the previous beta and loaded into the new beta. (A screen shot of the message is below). 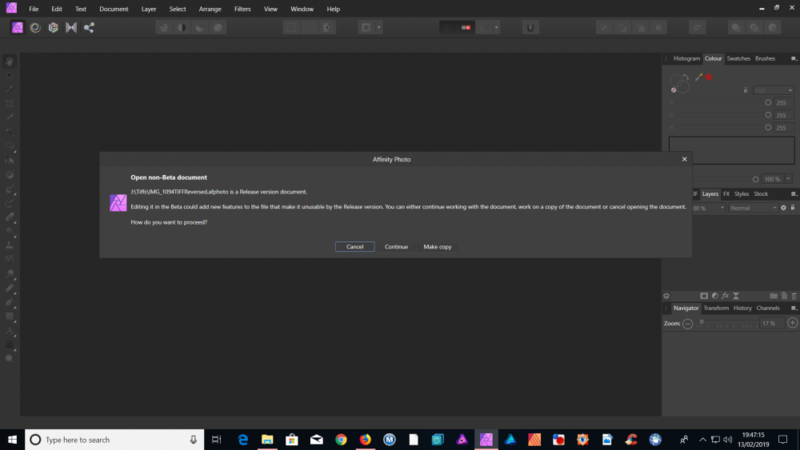 Further to this, when loading files into either the Beta version, or the non Beta version of Affinity, I get a message above the MENU BAR which says that Affinity Photo is not responding. Then when I tried to 'jog' the programme with either the left or right mouse triggers, the whole screen greys out. It can take anything from ten to thirty minutes for the screen to clear and at that point the chosen file appears loaded. Before I downloaded my first BETA, the proplem was only occasionally. After first loading the beta the problem got slightly worse, but only on the main Affinity programme. Since loading the new beta 243, it has got worse. I have just opened successfully, a Beta processed tiff in Affinity Photo 165.123. the released version. Then after closing it, I tried to load the same file into Affinity Beta 243 and was informed that the file is a release version document, when I know that I processed it in the Beta. It doesn't make sense and it driving me to distraction. I am uninstalling Affinity Beta to see if it was interfering with the Affinity released version. Then I shall reinstall it in a few days time and test it further. It might help if you would attach a TIFF file that exhibits this problem, so Serif or other users could examine it. Hi Walt. I have since uninstalled a programme that I used to use to resize from 72 t0 300 dpi and is no longer needed. I thought that may be interfering, so I want to test further before attaching a TIFF file. Thanks for your input. Just reading other postings on the new Beta and Other users don't appear to be having the same problems so it may be interference fom something on my PC. Will have to investigate further. Have you had chance to look into this further? I'd be happy to take a look at the TIFF. I'm not sure why you're getting the Not Responding message constantly. Does it happen with any image?